These final words of Hatikvah, Israel’s National Anthem resonate as never before in a week when the flawed Iranian nuclear deal gets Trumped, we celebrate Jerusalem Day and the shift of the US Embassy to the Capital…writes Michael Kuttner. As usual, Israel finds itself at the epicentre of the storms generated by these events. As far as the Iranian situation is concerned now that their mask of deceit has been ripped off by the revelations produced as a result of the recent operation to recover secret documentation, any doubt as to Iranian real intentions should be removed. Intelligence and security experts from various interested countries have already had an opportunity to peruse the data concerned and no doubt they can draw their own conclusions. As predicted, the original architects of this disastrous non agreement are loudly proclaiming its pristine infallibility and denouncing any attempt to rectify it. John Kerry, taking a leaf out of the clandestine diplomatic activities of the fatal Oslo proponents, has been frantically meeting with Iranian officials in an effort to scuttle any American withdrawal. Mesmerized as they are by the deceptions peddled to them, these purveyors of a deal guaranteed to dish up Iranian nuclear weapons and the missiles to convey them refuse to acknowledge the dangers posed. Not even hard evidence which shows years of deception and deceit will it seems sway the minds of those who learn nothing from history when it comes to being duped by fanatically fuelled leaders. Unfortunately there are also still some Jews who when hearing threats to annihilate and eradicate the Jewish State prefer to pretend that these intentions are either “make believe,” exaggerated hyperbole or even worse a result of our original sin for being here in the first place. Jerusalem (pictured). Photo Credit: Berthold Werner via Wikimedia Commons. There are plenty of Iranians who desperately wish to be free of the intolerable shackles imposed by a ruthless regime. Social and economic pressures plus a growing resentment of corruption and unemployment will eventually lead to an upheaval and this is the reason the Mullahs are eager to embark on diversionary escapades. That is why reinforced sanctions and additional pressure will sooner rather than later bring about the downfall of a regime which is oppressing not only its own citizens but also threatening its neighbors. Unfortunately the moral cowardice and hypocrisy of the Europeans combined with the mendacious avarice of commercial interests will do everything to keep the current status quo. Once again a tatty piece of paper will be hailed as “peace for our time.” We need to hope that saner policies will prevail and President Trump’s action is the first step on this path. A mere fifty-one years ago the divided city of Jerusalem was reunited and liberated from illegal Jordanian occupation. After nineteen years during which Jews had been ethnically cleansed, their homes and Synagogues destroyed, their cemeteries desecrated and holy sites made off-limits the City of David was restored. 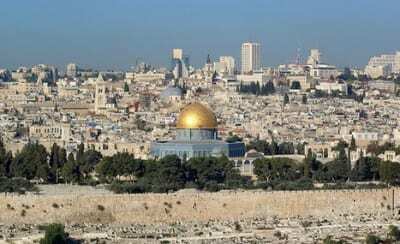 Those who today lose no opportunity to condemn, negate and nullify Jerusalem’s status as Israel’s Capital, were mute and silent in the face of Islamic incitement and religious discrimination of the grossest kind. Neither the UN, the Vatican nor NGO’s raised their voices in protest but after 1967 all these virtuous bodies suddenly sprang to life in order to censure the Jewish State. Jerusalem has been transformed beyond all recognition from a neglected backwater to a thriving metropolis where adherents of all religions are free to worship at their sacred places. Yom Yerushalayim is a day of unrestrained celebration because it marks an historic milestone in the long and tortuous history of the Jewish People. Today we face an avalanche of historical revisionism from all sides and an unbelievable tidal wave of hypocritical amnesia promoted by ignorant politicians and media alike. It is therefore a miraculous moment when finally an American President sweeping aside 70 years of double standards and appeasement of terror threats shifts the US Embassy from Tel Aviv to Jerusalem. The formal opening is an occasion for joy and thanksgiving and will undoubtedly be followed by other countries following suit. Nations which refuse to recognize reality and continue to believe that the Jewish People’s right to its ancient Capital is still subject to some sort of negotiation with those who deny our connection here are no doubt the same suspects who are aghast at Trump’s bold actions in ditching the Munich part two document. The festive occasion has not surprisingly attracted the ire of Abbas and his assorted friends. They have declared a “day of rage” and promised mayhem. This is the same agenda that they have followed for over 70 years and which has resulted in the dead-end they now find themselves. The annual “nakba” (catastrophe) riots, demonstrations and violence merely highlight a continuing obsessive hatred and a refusal to either strive for peace or acknowledge a legitimate Jewish presence. Unfortunately this delusional demonstration of vilification and revisionist narratives is encouraged by the actions and attitudes of double standards manifested by international organizations, morally bankrupted foreign ministries and the usual motley assorted haters on the left and right. Despite these seemingly insurmountable challenges Israel has never been in a better situation. We have more friends internationally than ever before and slowly but surely truth is prevailing. It’s a long haul but in the context of over three thousand years of Jewish historical experience what we have achieved since 1948 is nothing short of miraculous. We have paid and continue to pay a heavy sacrifice for the privilege of being accepted as a valuable member of the family of nations. Nevertheless we will succeed and for those of us privileged to be living in Zion at this time it is an exhilarating and awesome feeling.